Video distribution technology is in high demand. Smooth Automation eliminates the need for you to have sources in each room (cable / satellite boxes, Blu-ray players, etc.). Instead we center all video devices in a single equipment closet or other room as determined in the installation plan which we will work out with you in the earliest phase of the project. 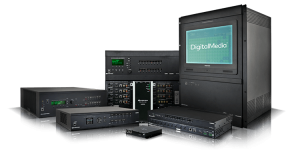 We utilize the newest, proven technologies on your behalf, including Crestron’s state-of-the-art 4K, High Dynamic Range (HDR), and the company’s latest DigitalMedia® systems. These solutions will simply blow you away with their ease of use and outstanding quality, reliability, and control, the power of which you must simply see to believe! Our team of professionals work closely with our top designers to deliver you with a sleek, clean and smooth appearance. The expert installers and builders from Smooth can discretely hide any boxes, components, and even the largest TVs! Once installation is complete, you and your family can then enjoy video in every room of your home if you wish. And, what’s more? You can see the camera views on ALL the TVs in you home, rather than just one, as is the case with other commercial applications. These are types of innovations that Smooth Automation can provide. Artfully designed. Seamlessly integrated. All for yours and your family’s enjoyment. Reach out to us today. We would love the opportunity to consult with you about a customized video distribution system for your home. Smooth also provides solutions for entire home automation that allow remote control of temperature, shading, audio and much more! We bring the art and science of technology together to expand your world. 2017-2018 Copyright Smooth Automation LLC. All Rights Reserved. Site design by CMT DEZIGN.